When my husband and I first got married, I thought variety in the kitchen meant cooking different flavors of Hamburger Helper each night. (I'm not kidding.) I've come a long way since those days, but recently I've tried to up it a couple more notches in the healthy cooking department. I'm no expert and am constantly bombing new recipes, but I've found a few keepers! 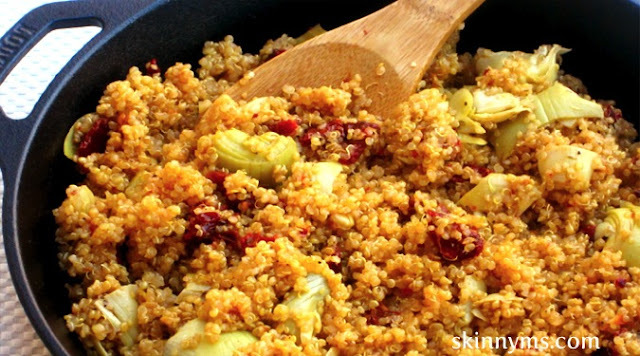 "Quinoa has a light, fluffy texture when cooked, and its mild, slightly nutty flavor makes it an alternative to white rice or couscous. Quinoa can serve as a high-protein breakfast food when mixed with, for example, honey, almonds, or berries; it is also sold as a dry product, much like corn flakes. Quinoa flour can be used in wheat-free and gluten-free baking. Quinoa may be germinated in its raw form to boost its nutritional value. Germination activates its natural enzymes and multiplies its vitamin content. In fact, quinoa has a notably short germination period: Only 2–4 hours resting in a glass of clean water is enough to make it sprout and release gases, as opposed to, e.g., 12 hours with wheat.This process, besides its nutritional enhancements, softens the seeds, making them suitable to be added to salads and other cold foods." Here are a couple of my recent Quinoa recipe faves. They are easy and quick. Just click on the recipe title to get the full recipes. Enjoy! I really liked this one from Eatingwell.com. It was gooey and delish! I substituted spinach for chard and it turned out fine. 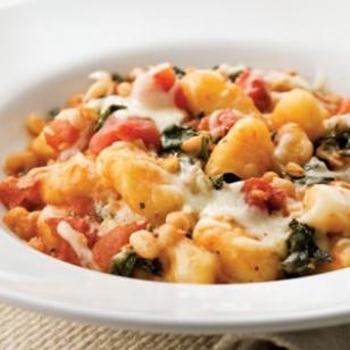 If you have never heard of gnocchi, it is an Italian potato/flour dumpling. I bought a whole-wheat version made with sweet potatoes and loved the taste. This was by far the entire family's favorite quinoa recipe I've made. This was also a yummo dish from skinnyms.com. If you like artichokes, you will love this. I did, however, choose to leave the sun-dried tomatoes out of the recipe, since they are such a strong flavor. I think I'll throw them in the next time I make it, though, just to see if I dig it! Love, love, love these! Can't wait to try these with my crew as we are trying to eat vegetarian-ish a little more often.